This project began as a series of experiments in using sand shading as a graphic element in veneered patterns. 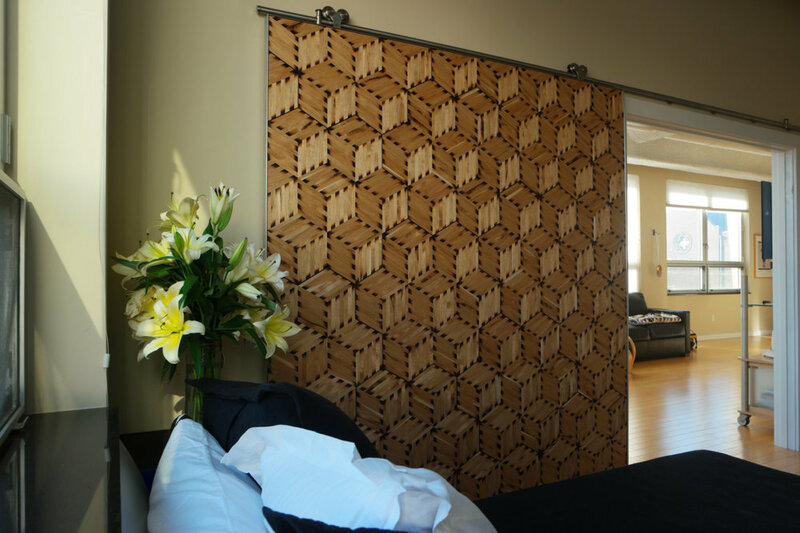 After dozens of samples and small objects I was already curious to see if the process would scale to cover more surface area when I was auspiciously asked by a client to design a large wall mounted sliding door. 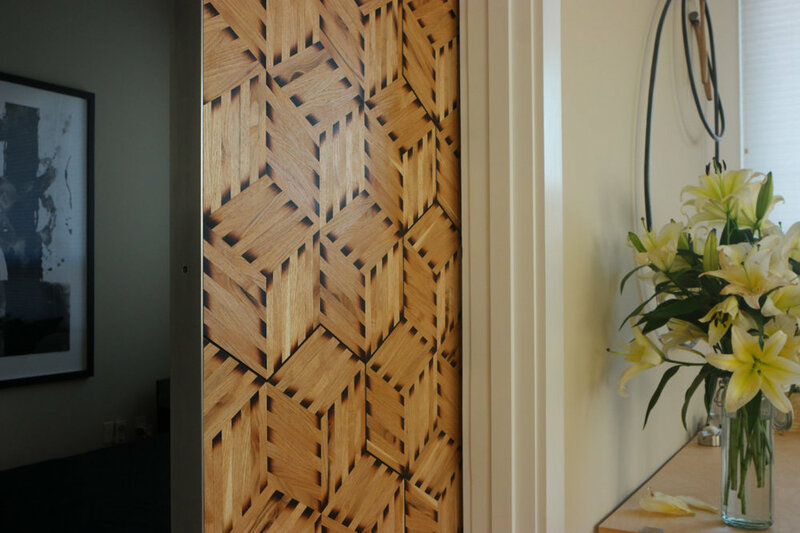 The door, which is 6′ wide by 7′ tall is veneered on both sides with 3,700 individual strips of butternut veneer. 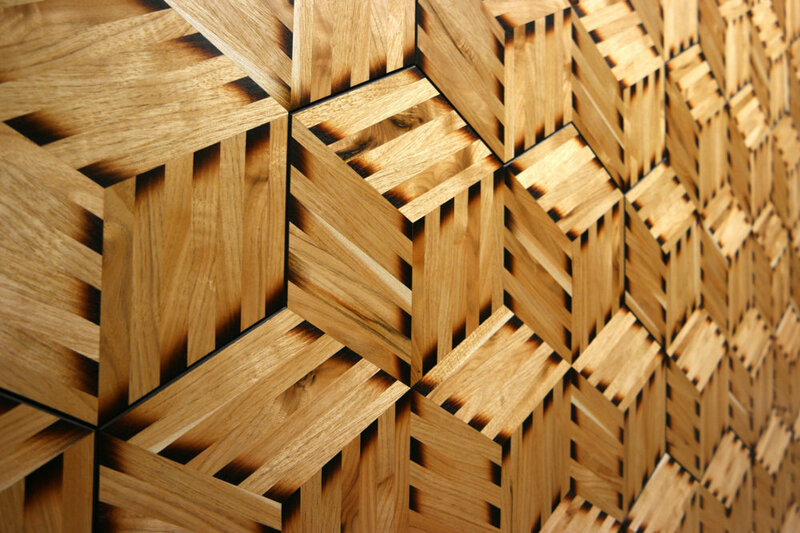 Each strip was cut by hand with a knife and burnt in hot sand before being arranged in a hexagonal tessellation. In order to cover such a large surface I veneered 1/4″ MDF “tiles” which I could then glue to the torsion box core using clamps and cauls. I used butternut veneer partly for its color and workability, but also for its chatoyant quality which glows as the angle of light and grain direction change. I made sure to choose a flitch of veneer that was full of knots and opposing grain directions so there was distinction between the individual strips of veneer. This process was documented in a video by my friend and talented filmmaker Jesse Beecher. You can learn more about how this movie came to be by clicking here.